This is my second plan that’s designed specifically for building roundhouses in stages. As I stated in a previous blog post, I think building roundhouses like this is the simplest, easiest way to build an earthbag home: build in stages, one roundhouse at a time so you can pay with cash and move in right away. It’s far easier to start small and add on later than jump right into building a large home that could take months or even years. Please note, this design illustrates just one of many possible ways to build in stages with an added greenhouse. Many of my clients come up with their own design, often by combining various plans and options of mine. So have fun. Make a simple sketch and send to me at naturalhouses [AT] gmail.com for a free estimate. One easy way to do this is to print the plans from my website and cut out the parts you’re interested in. Rearrange the parts as you wish, glue them to another piece of paper, and draw any remaining parts by hand. Write notes on your sketch if needed. Scan and save as a jpeg file and email to me. This could also be a fun school project and good way to learn about designing houses. on December 27, 2011 at 10:42 am kim t.
I like the idea of a separate guest room like this. would this be easy to adapt to an earthberm type home w/ the back side built into a hillside? Yes, it would be easy to berm this plan. Nice plan! I like the idea of indoor grow bed in the hall. Every morning you’ll walk past the greenery, make it easy to care for plants as a part of your daily routine. Plus I bet the sun and warmth feel good in winter. Also, two doors between the main living space make for plenty of sound protection for the master bedroom. I agree. All good points. This is something I’d consider building for myself (and I’m very particular). This is perfect! After convincing my husband that earthbag building is the best choice for our future Jamaican homestead, he also settled on this plan. We will build the roundhouse studio first as a future guest house. However, I desire a type of roof that can be part of a rain water catchment system and won’t blow away during a hurricane. Flat roofs rule in Jamaica because of hurricanes and that means more cement….exactly what I am trying to move away from. The only thing that comes to my untrained mind is a metal roof. Any thoughts? The best roof for you is a ‘flat roof’ (actually low slope about 1.5 degrees) with a parapet around the sides. It’s easy and won’t cost much to change the plans. Is this at $10.00 / sq.ft? who do I call? $10.sq. ft. is the bottom range if you go all out to use salvaged/free materials where there are no codes. For consulting, my email address is shown above. Greenhouse floor: Recycled brick set on a layer of sand is probably the easiest and nicest. Or you could just use pea gravel, but that would get tracked throughout the house and make a mess. The grow bed is contained in a planter. Wrap-around porch would be great. Make sure the greenhouse gets adequate sunlight. The gravel bags form the foundation under the earthbag walls. Fill in the rest of the area inside with tamped road base, gravel, etc. Crawl spaces will add to the cost of construction. It’s much less expensive to build a slab floor, etc. on grade. This is great! I already had the idea of building a house out of two prefab round house kits, but it’s great to see a visual of how they might look put together. I’m been saying for quite a while the easiest, fastest shape to build with earthbags is a roundhouse. Build one roundhouse and then add on later if you want to avoid debt. Adding a connector space is a simple solution for joining them. Plan ahead and you could create more complex designs. I need to do a blog post on this: put a window where you’ll need a door someday. Frame it out in advance just like a door. Add some bags inside the frame up to windowsill height and install the window, etc. At a later date it’s easy to knock out the filler bags and install a door. I live in Kenya which has a tropical climate so we don’t need a greenhouse. Why not alter the width of the greenhouse area to turn it into an enclosed terrace or lounge and throw the doors open during the day, provide mosquito protection in the evening and shut it up for the night. This will give you an extra lounge or dining room area with an inside/outside design, particularly by adding a patio, possibly roofed, in front of it. It could become the main entrance to the complex. I think I would like to build this. All excellent ideas. It’s always best when you adapt designs to your specific climate and needs. 18′ is the exterior diameter. My area measurements are of interior floor space. Earthbag walls are 18″ thick, so deduct 3′ from 18′ to account for two walls. That means the interior diameter is 15′. The radius is 1/2 the diameter or 7.5′ in this case. The area of a circle is pi x radius squared or 3.14 x 7.5 squared = 177 sq. ft.
Owen, would the low slope/parapet roof for rain water catchment work in New Mexico as well? Would metal be a suitable material for that? Yes, but you’ll want a minimum slope of about 2:12 to prevent leaks. Seal the screw heads with silicone. Great idea of expandable construction. My thoughts are to incorporate Tony’s idea of replacing the greenhouse with a wider pass-through. Incorporate a pantry and utility closet on both sides of a N facing exterior door, but sitting area and passageway with double doors along S facing wall. Also, the main round section single-story and a large roof over both that and the passthrough, similar to the roof for the Double Unit Ecoresort, primarily for rainwater harvesting. Then build the smaller round unit later for master bedroom. This would be located in the southern Big Bend area of Texas, the northern Chihuahuan Desert. Regarding the roof for rainwater harvesting: How about a shed roof with large overhangs, especially in front (south or southeast) for shading that wall and to shade an outdoor living area? Would facilitate both required shade and rainwater catchment for off-grid living in southern Big Bend area of Texas. Just not sure how to incorporate roof/ceiling (a gap between the two helps cool structure underneath). I love this design – go back and forth between thinking I will use it inside the dome fort design, or the zero energy four. For the two roofs on this one, I was going to get a yurt roof from Smiling Wood Yurts. They are metal and so work for catchment, and they have a big round openable skylight in the center, which if I remember right can be tinted. I definitely wanted that when I looked at land down by Terlingua. Now I am looking up closer to Dallas, though. HTH! Good luck on building any thing alternative in or near Dallas area. When I mentioned adobe, I was treated like I was a witch or hippie. I’m in Terlingua now, where building codes are what you make it. Right. It’s far easier to build in rural areas. A few of us in Terlingua area are hoping to organize an earthbag workshop in the future! Great. Please keep us posted. You can post free workshop announcements on our Workshop page at Earthbag Building.com and Bulletin Board at Natural Building Blog. I love this plan. It’s perfect to start with the main house and then add on in multiple directions as the family grows. The idea of adding a greenhouse to separate rooms, rather than useless hallways is great for the Pacific Northwest. We can grow beautiful tomatoes there! If I’m using CEB and want to do simple squares and rectangles instead of the pretty roundhouses, I could probably still do something like this, just with different house plans, right? Build the Zero Energy One and then later an art studio and connect them with a greenhouse walkway? Sure, you can customize the design lots of different ways. Reblogged this on Modern Pioneer Magazine. I am interested in purchasing this design with some modifications. I would like to make the bigger round home a diameter of 33′ with a loft of 224 ft and the smaller guest room diameter of 26″ with small loft. Please let me know. thanks. Sure, you could do that. 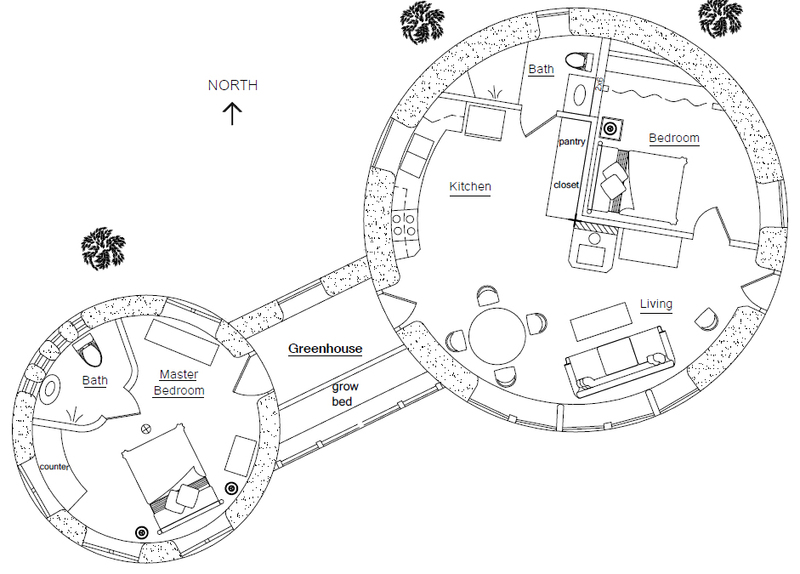 I no longer do custom plans, so you’d have to buy this plan and the 33′ roundhouse. I’m sure you can figure out the smaller room. Send me at email and I’ll give you a special price. Thanks that sounds like a good plan. I will email you my info. Im also buying the books to learn how to build. The 18 inch bags are just to heavy for me to move by myself. Can I substitute for the 14 inch ??? A typical earthbag wall made with 18″ bags ends up being about 15″ wide. That creates a nice stable wall. Any narrower then the wall tends to tip over (become unstable). There are several options. Some people fill the bags in place on the wall so the heaviest thing they have to move is a coffee can of soil at a time or some other similar container like small bucket. Have several people work together into a human ‘chain gang’ crew. Start with a small 200 sq. ft. house or so and you can build the walls this way in 2 weeks. Other alternatives you can search on our Natural Building Blog: scoria bags, thin walls, etc. Lots of options.